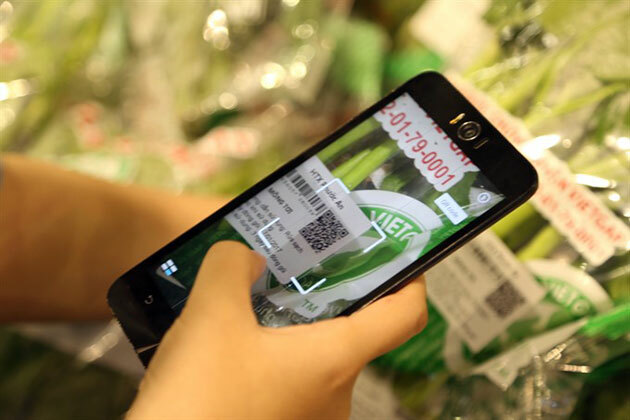 Consumers in Ho Chi Minh City can now use a smartphone app to trace the origin of vegetables sold at Co.opmart, Lotte Mart, Big C and AEON supermarkets under a programme run by the city Department of Agriculture and Rural Development and the Digital Agriculture Association. Huynh Thi Kim Cuc, the department’s deputy director, said customers could use Zalo on Android or QR code scanning apps to scan the labels on the packages. The information they contain includes where and when the vegetables are grown, packaged and distributed and the types of pesticides and fertilisers used, she said. The initiative followed growing concerns about food safety, she said. The department and the association has surveyed and collected data on vegetable farming models since May last year. Now only two co-operatives – Phuoc An Co-operative in Binh Chanh district and Phu Loc Co-operative in Cu Chi district – are part of the programme, and they are supplying 18 items, including cabbage, cucurbit, cucumber, bitter melon, broccoli, sweet potato buds, water spinach, and amaranth. The programme would be piloted at select supermarkets and VietGap-certificated vegetable co-operatives until March before being expanded to all VietGap-certified co-operatives and more retailers, Cuc said. She said her department and other relevant agencies would closely monitor vegetable quality, carrying out surprise tests and quick tests. Nguyen Phuoc Trung, the department’s director, said a million tonnes of vegetables are consumed in the city every year, with 24 percent supplied by farms in the city around and the rest by those in other provinces. The department said the city was paying more and more attention to the safety of vegetables, resulting in plant protection drug residues decreasing year after year. In fact, last year authorities did not detect any plant protection drug residues exceeding permissible levels in key growing areas, down from 1 percent in 2015, it said. Last month, the city launched a programme to enable consumers to trace pork origins at nearly 350 modern outlets by downloading the QR Code decoding application from www.te-food.com to their devices./.